A clearer look at the fight between the Clegane brothers, Gregor and Sandor, than what we’ve had before. 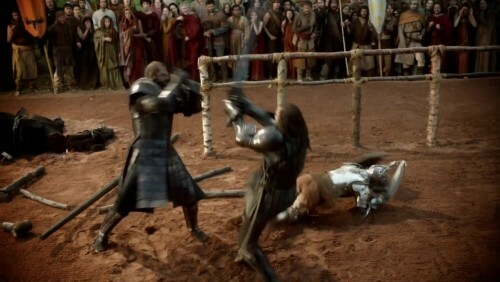 The Knight of Flowers, Ser Loras Tyrell, is on the ground. The background still seems to feature the sort of green you’d expect from a greenscreen, but presumably that would be removed for the final shot (or maybe it’s not a greenscreen at all, but perhaps the side of a large pavillion). We also get a couple other examples of heraldry, the bull moose of the Hornwoods (held by Doc, who tells us he came to hate having to hold the thing for endless takes) and a very pale rendition of the Tyrell golden rose on green.